On the 23rd of October 2013 I travelled to Nepal with an eager team of students and staff, lead by the charity ‘True Adventure’. Our goal of the expedition was to paint a primary school and give each child from the school a gift. We flew from London Heathrow to Doha, then from Doha to Kathmandu airport. I remember looking out of the window and seeing the sunrise, it filled me with excitement for the expedition ahead and I dreamed of all the new things we would experience and people we would meet. As we flew over Nepal we could see the Himalayas, which was truly a sight to behold and it only excited the team further. After we got off of the plane and went through passport control, we crossed a road to meet our guide for the trip. He was a short tanned skin man with black hair and a smile like a Cheshire cat. His name was Vivek and he was very pleased to see us. After giving us all necklaces made of flowers and saying ‘welcome to Nepal’ he herded us onto a mini bus, and we were on our way to our hotel. (Where we would stay the night and leave for our project site in the morning.) 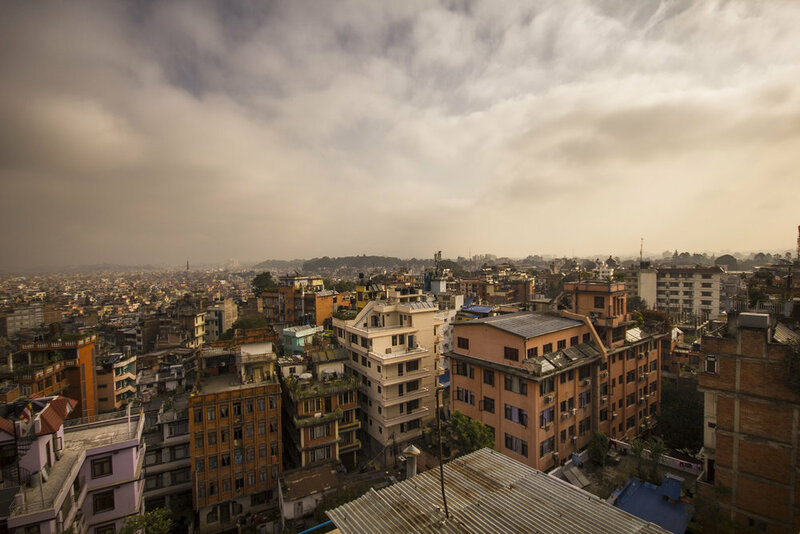 Upon leaving the airport we drove deeper into Kathmandu and it was amazing, this City was moving a mile a minute. It’s safe to say I had never seen a City like it. To outsiders like us it seemed crazy! People zooming every which way on mopeds, music and lights everywhere. Not to mention someone trying to sell you something at every opportunity. After a short journey we arrived at a bus stop and once we got our large bags off of the roof, Vivek said ‘right, follow me’. So we followed in a single line into the heaving streets of Kathmandu. As Vivek lead us through narrow alleys and twisting roads, we were all astounded by how a normal day looked here. Once we found our hotel, we dumped our bags in our room and went exploring! I was taken in by all the illuminated signs, the strong smell of incense and the cultural music that seemed to play everywhere. This place was an explorer’s paradise. We went for dinner in a local restaurant, I chose a mild curry, and it was the single best curry that I have had to date! With so many natural flavors and spices, a curry is a must have in Kathmandu. After dinner we all got an early night for the big day ahead. The Next morning we woke up and ran up to the highest point of the hotel roof, we were astonished by the incredible views of the City and how it all seemed so colourful. After a quick breakfast of fruit and meat, we were all packed onto another mini bus. The team leader (Mark) told us that we had some free time before the school was ready to greet us and he asked us what we wanted to do. Having researched Kathmandu prior to arriving, I suggested that we visited the Pashupatinath temple as I knew it would be a life changing experience and would be the perfect subject for photography. The team agreed with me and we were off to Pashupatinath! The first thing we noticed were all the different street venders selling clothes, Jewellery and powdered dye, it was all so beautiful and a world away from the life we were used to living in Sussex. As we ventured further into the temple grounds we noticed the sacred Bagmati River, where people put the cremated remains of their deceased family members. According to Nepalese Hindu tradition, the body must be dipped three times in the river before the cremation. Another thing we noticed were the Holy men or ‘Sadhu’ these are the wondering monks of Nepal and India, who have left behind all material attachments as well as their families. They travel searching for enlightenment and rely on people’s charity to survive. They also make great photographic subjects, due to their colourful clothing, kind behaviour and generally ‘different’ aesthetic. Final thought of the day: Nepal is a truly amazing country, from its heart-warming scenery to its peaceful and welcoming people. In the morning we set off for the Shree Ganesh Primary School in the Kathmandu valley. As we bounced around the rocky terrain in the mini bus we were all taken in by the fantastic landscapes that Nepal had to offer, from the vast mountains to its stunning farm land. After an hour or two we arrived at the village, we were greeted by the students who each gave us a necklace of flowers and said the international greeting ‘Namaste’. We all felt so welcomed by the village and the children. After we were all introduced, the team and I climbed a large hill to set up our camp sight. Once we arrived at the summit we were very pleased to see that the guide company (Sacred Summits) had supplied us with thin sleeping mats for our tents. After a few minutes the children ran up the hill and gave us some green fruit. After a while of trying to figure out what they were, we realized that they were unripened oranges. We said thank you and they ran off back down the hill. Once we were all set up, we ventured back down the hill to interact with the children and play some games. We quickly found out that the main games the children played were football, and a game where everyone joined hands and formed a circle around one person, while singing. (It was actually really fun) I still find myself singing the song from time to time. After taking as many pictures of the village as I could, the sun set and it was time for our first nights camping in Nepal. One thing I will never forget is how amazing the stars were on top of that hill. It sounds stupid but they seemed brighter and somehow closer than what we’re used to in Britain. Possibly because there was no light pollution, the stars really looked like bright diamonds in the sky. This was a once in a life time experience and I'm so lucky to experience it with my friends and teachers.